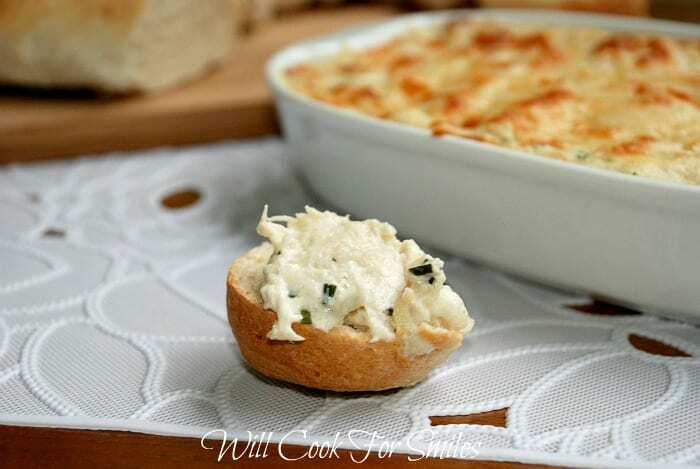 Absolutely incredible and easy Crab Dip! This creamy crab dip is made with lump crab meat, cream cheese, Parmesan cheese and baked to perfection. You remember what happens when my boys are away? Alone time! I do whatever I want and it includes seafood for dinner. I got some nice crab meat last week and I’ve been drooling over it ever since. So I made myself this delicious crab dip. It is just so nice to be able to make dinner for one, pour myself a glass of white wine, and enjoy my dinner in peace and quiet. Oh, and did I mention that I could watch whatever I want? Before making the dip, separate the lump crab meat and look thoroughly to make sure there are no pieces of shell. 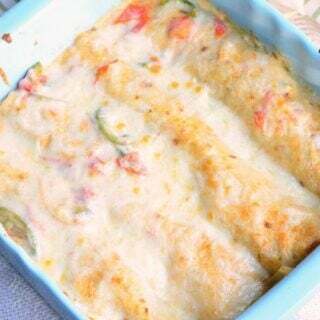 Preheat the oven to 350 and while preheating, prepare the dip. Transfer the mixture to a lightly greased baking dish and top with the rest of the Parmesan cheese. CAN I FREEZE CRAB DIP? Although some may suggest freezing leftover crab dip, I do not recommend it. This dip had cream cheese and sour cream and neither freezes well. Since cream cheese and sour cream contain a good amount of moisture, once it’s frozen and defrosted, texture gets broken down and grainy. If you have leftover crab dip, you can easily store it in the refrigerator for up to 3 days. Make sure to cover the baking dish well with plastic wrap or transfer it into a storage container with an air-tight lid. To rehear crab dip, I recommend oven over microwave. 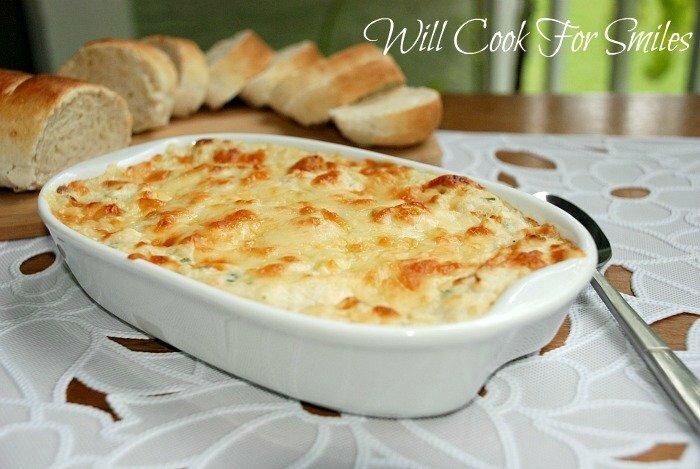 Spread cold crab dip in a baking dish and reheat at 350° until hot in the middle. You can even spread a little more cheese on top before reheating. 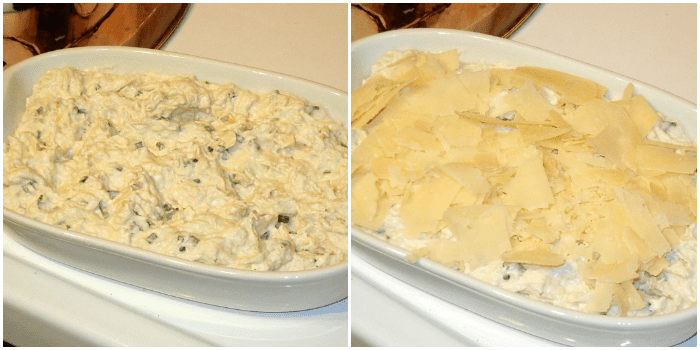 Easy, amazing, creamy crab dip made with lump crab meat, cream cheese, Parmesan cheese and baked to perfection. Before making the dip, go through the crab meat and look thoroughly to make sure there are no pieces of shell. Originally published on Will Cook For Smiles on July 18, 2012. Oh, that looks delicious! I love a good dip & this sounds amazing! Wow – the name says it all! Love it. I found this through Turning the Clock Back’s What’s Cooking Wednesday. I have linked in an attempt at meatballs. Have a lovely week. Stopping over to pin this recipe. 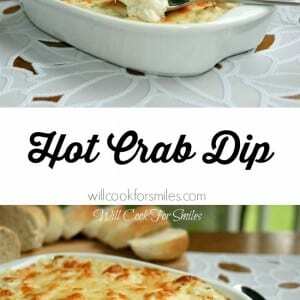 This is a great Hot Crab Dip that we would just love, I can almost taste it. Hope you are having a great week and thank you so much for sharing with Full Plate Thursday. This crab dip looks and sounds delicious. I’m going to have to give it a try. I love dips! *Stopping by from Blissful & Domestic. Love your blog name by the way! Ahhhhh, the whole scene sounds heavenly. Quiet dinner, wine, peace and quiet, watching something YOU want to see…..
Oh my gosh this looks amazing!!! 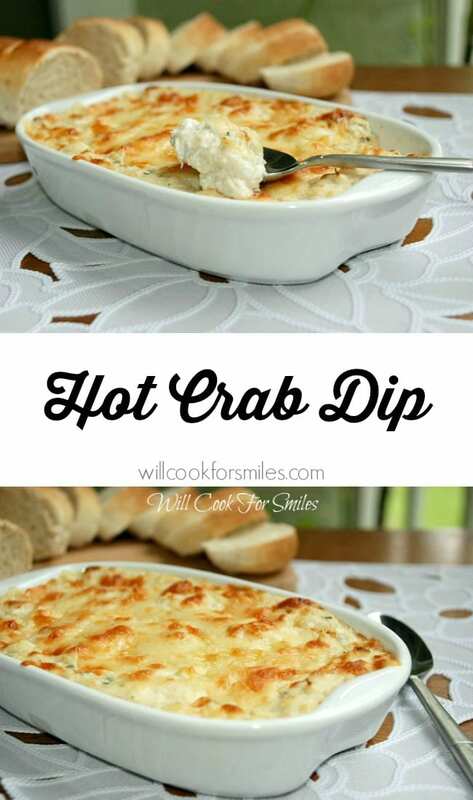 I love hot dips, and LOVE crab, so this sounds perfect! I could probably polish off the whole thing in one sitting!!!! Thanks for the recipe! Your photos pretty much have me drooling… like a lot! What a gorgeous looking dish. 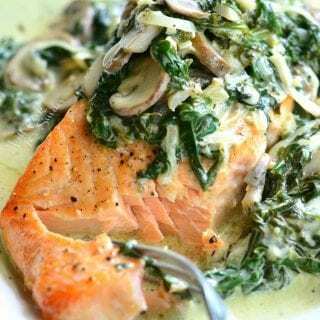 Hopping over from Melt in Your Mouth — hope you’ll swing on over to SalmonAtSeven — I too am bringing seafood dishes this week. 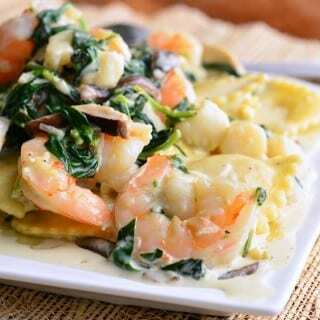 I simply adore crab, salmon and shrimp… oh my! 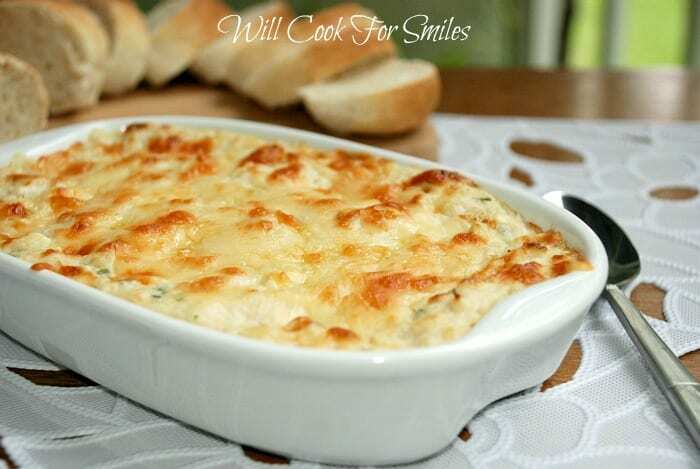 I so love crab dip, and your photo looks so good I wanted to grab a bite right off the screen! You have really good photos. This is waiting for me to make it. So glad you shared your creative inspiration with Sundays’ Best – you always help make it a great party! 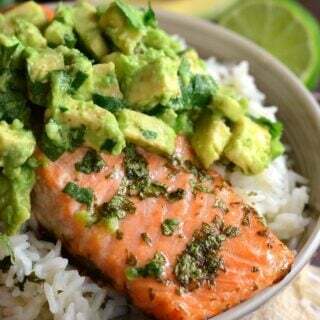 Holy mackerel this looks divine! Pinning now! You’ve been featured at Wednesday Whatsits! Thanks for sharing. Stop by and grab a button. This looks SO GOOD! I love hot dips like this. Thanks for sharing your recipe on Melt in Your Mouth Monday! I liked the recipe so much, I could not cook it in the oven, so instead ate it cold…. 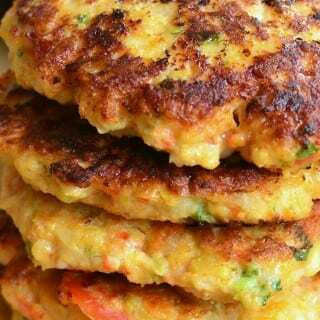 with the addition of some crunchy vegetable… delish.. Thank you! I bet it was delicious cold and with veggies!! I’m in love with this Lyuba!! Can this be served chilled? Can’t wait to try it. How do you shave parmesan cheese. I just buy shaved Parmesan cheese in a refrigerated section of my store. it’s usually in a little sealed plastic tub. Just made this…. Delicious. Thank you. I’m making this for Christmas Eve and want to know if you have tried cooking this in a crockpot. I’ve found a lot of recipes but yours sounds better than any of the others. Can’t wait to serve this for my family. 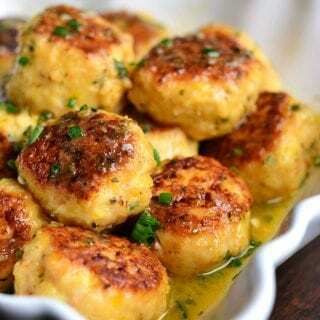 We love seafood and will be having Oyster stew also. I don’t see why this Crab Dip won’t work in a crock pot, I would try it. I’d recommend cooking on low for a couple of hours. Thank you! I could bake it then transfer to small crock pot to keep it warm. Hi there! 9×13 would be way too big got this dip. This only makes about 3 cups of dip so you can use a smaller dish (Unless you double the recipe). You can use a bread baking dish, a one a half quart dish, a dip baking boat, a smaller cast iron skillet. Just remember if the dip is spread thinner, the baking time will be less. I hope you enjoy it, Carrie! How long can this dip be in the fridge before baking it? What do you serve with the hot crab dip? I see bread, can you use maybe tortilla chips?? We use Ritz crackers. Pita chips is another option. I made this on Christmas Day and everyone couldn’t stop eating it (glad I doubled it)! 😉 So delicious I added 1/4 tsp of Old Bay. I would also pat the imitation crab dry with a paper towel so it’s not too moist. Hi, This dip looks incredible I need a dip recipe that I can make ahead and freeze. Do you think this one would work – cooked first? or frozen uncooked?? To be honest I don’t use my Worcestershire often and it’s always a little bit so I have a bottle in my fridge that lasts me over a year 🙂 It have quite a specific flavor but you can add a little hot sauce with a little brown sugar for sweetness. The recipe won’t be affected too much if you even omit the Worcestershire all together, so you don’t have to use it if you don’t have it. I hope you like the dip! THIS WAS DELICIOUS . ADDED A FEW OTHER THINGS TO IT, DILL AND OLD BAY SEAFOOD SEASONING. THANKS FOR SHARING. How many servings is this considered. I want to make a large quantity for wedding appetizer. I made this recipe. No changes. It was simple and delicious. Thank you. I served this tonight and it was fabulous! Thank you for sharing!